and a fisherman, seeking answers to why his once-vibrant wife is now chronically ailing and wasting away, begins a quest to find and confront the god of all gods. These stories intersect and wrap around each other, revealing deeply disturbing truths about the artificial world they inhabit. Filaria is the first novel from a new Canadian genre press, ChiZine Publications. Before I even opened the book, I was impressed by its production. From its gorgeous cover to the typesetting, Filaria looks and feels like a book that should have been published by a major house—no small feat for the first outing of a start-up publisher. But looks aside, the true wonders of the novel lurk within. The title of the book refers a genus of fluke-like parasites that infest the blood of mammals, a role the inhabitants of Hayward's novel replicate, as they roam the claustrophobic corridors and bowers of the many-leveled structure that is their home, world and prison. Hayward weaves their stories together as they claw their way upward in search of answers. Filaria is a startlingly original and unsettling vision of humanity's possible future, blending post-apocalyptic SF with the suspense and weirdness of Lovecraftian horror. Filaria is a double debut: the first book to be published by the new macabre fiction imprint ChiZine Publications (an offshoot of the Chiaroscuro website run by Toronto author Brett Savory), as well as the first novel by Toronto writer Brent Hayward. The story’s framework borrows from a pair of science-fiction conventions—a future society with a rigid system of social stratification, run entirely by machines. Beneath a dead planet a sort of human ant colony has been set up by a legendary engineer. The colony consists of 32 levels—each a city in itself—connected by an advanced elevator/transit system. At the top, Level One, the beautiful people live on plantations. At the bottom, sickly ghouls labour as garbage collectors and sewer workers. At the beginning of the novel, the network that runs this claustrophobic system has broken down. Chaos ensues. What’s more, an alien force seems to have invaded the subterranean biosphere, motives unknown. The narrative has four parallel threads that never actually meet but are each indirectly related. A young Morlock from the 32nd floor is chased upward, pursuing an unlikely destiny. A privileged plantation princess climbs to the edge of the known world and beyond. A centenarian lift attendant begins his last ascent. And a troubled family man finds himself drifting to the lower depths, seeking some kind of primary energy source. Much of the story remains a little vague, and is made more so by Hayward’s technique of eliding crucial plot points, but this also leads us to sympathize with the characters’ confusion in their newly out-of-joint and de-compartmentalized world, and emphasizes the story’s prominent (but not restrictive) allegorical qualities. First and foremost, however, Filaria is a great read, crackling with invention, energy, and suspense. For both ChiZine and Hayward, it’s an auspicious start. Two men, one young and curious, the other old and as set in his ways as a grandfather clock, guide a beat-up car through a seemingly endless maze of uninhabited tunnels as they search for a missing girl. Young Phister (as he’s known) works look-out as his cantankerous partner navigates the car, which keeps informing them via a voice box that they are “grossly abusing” a Public Works vehicle. When they are flagged down by an aging playwright also searching for a missing person, Phister is forced to question everything he has believed about the world and himself up until that moment. Why? Because the playwright, in his 50s, still has his hair and teeth, and everyone Young Phister has ever known has been toothless and bald since childhood. Brent Hayward’s debut novel is full of such jarring moments, in which various characters stumble upon each other in the back stairwells, elevator shafts and forgotten corridors of a vast underground city that has fallen into disrepair over the centuries, isolating its citizens in a series of unique, parallel worlds. Is the city a crumbling bomb shelter? What drove its inhabitants underground? A plague? A nuclear firestorm? No one can remember, and some, like Young Phister, have lived for generations in total isolation. What makes Filaria so compelling is Hayward’s innovative narrative structure, which effortlessly shifts between the interlocking journeys of four major characters, each from one of the underground city’s radically different worlds. Hayward forces the reader to experience the four journeys through the limited perspectives and life experiences of his confused protagonists, and in doing so dramatizes the ways in which environment, history, disease, social hierarchies and technologies interact to create what seem to be self-evident truths about the universe and our place in it. Even better, the heady ideas are brought to life by an increasingly creepy story of artificial intelligence gone very bad, entire ecosystems of mutated creatures both organic and robotic, and a cast of all-too-human characters as frightened and curious as the reader. A disquieting, claustrophobic, compelling hybrid of China Miéville and J. G. Ballard. I first read Filaria almost two years ago: its subterranean imagery has been stuck in my midbrain ever since. 3.0 out of 5 starsToo Heavy and Boring. I tried to read the book but to due respect to my second cousin, at least I tried. Usually I like heavy books but I'm afraid this wasn't my thing, sorry Brent. This was my second time reading one of Brent's stories. Why so heavy? 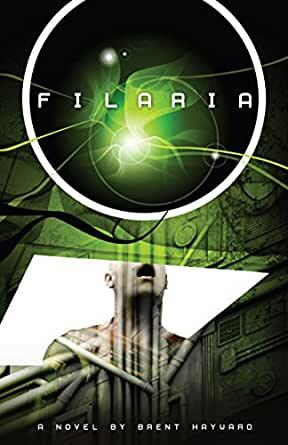 Filaria is, in its conciseness and its oddly disturbing grace, one of the finest debuts written in the last decade -- in the sff genre or any other genre. For a fast reader, it could be consumed in nearly a breath, but this would be to miss the point entirely. This is a book meant to be examined, to be known. What strikes me as so unique is how Hayward manages to build such a intensely resonant world in so few words. You will not forget having been in this book. Images, perhaps even whole scenes if you're visually minded, will stick with you for the remainder of your life. "There is a scene in it where two ancient elevator-repairmen brothers are hanging in a massive (and malfunctioning) elevator shaft--or rather, have been hanging in a massive elevator shaft their entire lives. This may seems a somewhat mundane scenario when compared to interstellar wars and such, but there is for me this moment of consideration: what must life be like, hanging in silence and darkness for most of your life, waiting on... what? An elevator car that will never come? It's frightening to consider, and yet in its way it is also beautiful in an immensely sad way. It's almost like considering death, that great unknown." Anyway, you should buy it, because it's great. FILARIA will worm its way into every section of your brain like a tiny parasite that sneaks in and slowly awakens and fires up your neurons. The world is a mere shell of what it used to be, littered with remnants, populated by a ragtag bunch existing on multiple levels. Each subset of this fractured world is largely ignorant of the others, with minds full of myths and scuttlebutt. Brent Hayward shines a spotlight on four people, the narrative lens closing in on the minutiae of their lives as if the larger world where they existed was irrelevant to their respective tales. But there are hints that if you pull the lens far enough back, you will see that world and how they each fit in it, that their lives are interrelated and intertwined. Stylistically, I can't recall reading anything written in this manner before. It is superbly novel and fascinating. The structure simultaneously elucidates and mystifies, maintaining a high level of intrigue. Both the microcosmic and macrocosmic views reveal a world that is ultimately foreign-- a desolate, splintered world, de facto functioning separately and independently but simultaneously suffering for the lack of integration. The depth of the characters is matched by the intricacy of the worldbuilding. FILARIA is a masterful blend of simplicity and complexity. There is simplicity and a linear symbolism in the imagery of a man hanging on near the bottom, always looking up at heights he so wishes to reach. There is complexity in the imagery of the same man hanging on-- to existence for its own sake, to a sense of duty, to a hope that he knows is ultimately futile. Hayward prodigiously strings words together. Even when he describes a bleak landscape or a hopeless situation, it is nonetheless exquisite. There are so many tiny, wondrous details in the world he has built. I deliberately slowed down my reading lest I miss any of it. There are strange and fascinating creatures. There is effective symmetry in how mundane objects are deemed talismanic and ultimately crucial ones as decorative and useless. Hayward deliberately weaves every seemingly isolated thread into a beautiful tapestry, going back and forth between the four individuals, slowly revealing bits and pieces of the world by unveiling more details about their lives. This is a story of survival and a story of death. It is a tale of realized culpability and the possibility of redemption. There is love, lust, disdain, indifference. It is where myth encounters reality. It is the bridge between self-image, actuality and potentiality. This is a story about searching for something with no certainty it even exists. I hate this book. I absolutely detest it. Why? For this reason: I can no longer be content and blissful in my ignorance. I am now fully aware of the pitiful limits of my imagination and intelligence, for not in a million years could I have conceived of such a labyrinthine world, populated by such distinct individuals, written in a compulsively readable style and structure. Brent Hayward manages with a few words or lines to express what I would be unable to in ten pages. Heck, I'm bumbling through this review, feeling inadequate to the task of describing how challenging and rewarding reading this book is. I doubt I shall ever be equal to the task. When I started out with this novel, I thought the description sounded to my liking, but after getting in about 30 pages through, I wasn't so sure. I am one for sci-fi and fantasy, but the world seemed so absurd...almost to the point of ridiculousness. But after I got to about page 50, I realized I was no longer wondering, "Should I continue reading this?" because I was actually getting into it...and liking it! The first thing I noticed was how high the diction was. A lot of the words are archaic, adding to the tone of the book. Some of the words are just weird. And some of the words are made up. Everything you could ask for in a sci-fi novel! The grammar was impeccable, and I absolutely love this writer's style. Even though I'm not typically interested in description pertaining to environment or place, it's almost impossible to understand sci-fi without understanding the world the characters are living in (or in this case, worlds?) A lot of the metaphors also caught me off guard, but in a good way. Most were so original that I literally had to sit there in a silence for a few moments to completely absorb what I had just read. Humor was integrated well into the stories, as well as sadness, and a feeling of nostalgia (at least, for me). My favorite character was "Tran so." Saying that, however, one of the only complaints I had with this novel was the added sexuality. I typically embrace sexuality when sexuality is due, but in this novel it just felt out of place and awkward, especially when I started looking up to Tran so as a sort of father-like figure. The only other complaint I would say I had with this book was that I didn't really like that we had to keep up with four different characters. It would be different if the chapters were shorter, or if the characters had more to do with each other, but it was definitely hard to keep track of what had just elapsed when changing from one character's POV to another.